This cake rocks. It rocks because it’s easy to make, and it rocks because it’s best the next day and beyond. Oh, did I mention that it’s super-delicious too? It’s moist, chocolaty, and has a nice smooth orange liqueur taste. It’s not a liquor-soaked cake that makes your gums go numb. I’ve made this quite a few times and every time I thought “gee, this would make a great gift if I had a mini-bundt pan.” This year was the year and I bought a pan. I filled the minis about 3/4 full and had a small amount of batter left over, so I also baked two cupcakes. Perfect for taste-testing! Instead of unmolding the cake and then pouring a glaze on top, you poke holes in the bottom of the cake while it’s still in the pan and then pour a syrup on; it goes into the cake and around the sides. The recipe is originally from Cooking Light magazine, but I can’t find it on their site. It was called something like Mom’s Company Cake. When I’m talking to myself, I call this “The million dollar cake.” Yeah, Grand Marnier is pretty expensive. I bought another brand of orange liqueur once and did a taste-test and the Grand Marnier won by a mile. I’m not usually an expensive liquor type of gal, but in this case I am. I haven’t tried this with orange juice, but I think it would be good. If I used juice, I’d skip the water in the syrup and use all juice. I packaged these in plastic bags to give as gifts, but next time I’ll put the cake on a plate and then wrap it up with plastic. The syrup makes the cake sticky, so I think a plate would work better. Preheat oven to 350°. 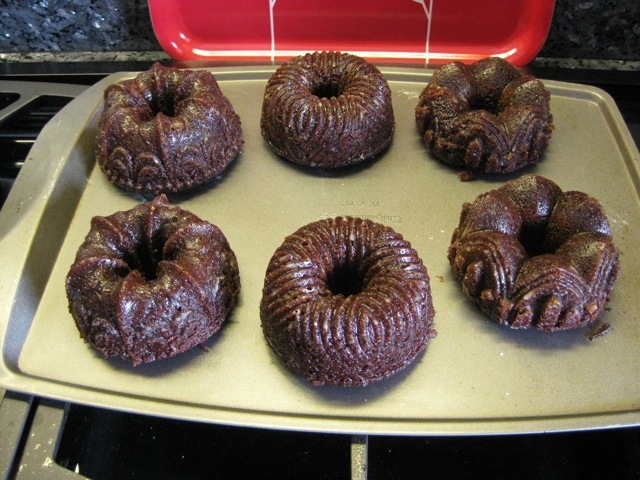 Coat a 6-cup bundt or angel food pan with cooking spray; dust with flour. Combine all cake ingredients in a large bowl; beat with a hand mixer at low speed until most, then beat 3 minutes on medium speed (if you use a stand mixer, beat for less time; it doesn’t need a thorough beating). Pour batter into pan. Bake 40-50 minutes or until a wooden pick inserted in center comes out clean. Leave cake in pan. Pierce with a fork about 15 times. Combine syrup ingredients in a saucepan and boil 1 minute. Pour glaze over cake slowly while cake is warm and still in the pan. There is a lot of syrup, so you may need to give it a minute to soak in before pouring all of it, or poke more holes to give it somewhere to go. Cool completely; remove from pan. Wrap securely to keep moist. This is best served the next day or even a couple of days after baking. Minis will bake in less time. I used a pan with an intricate design, so I coated it thoroughly with butter and then dusted with flour. I had to work at getting them out, but they did come out in one piece. 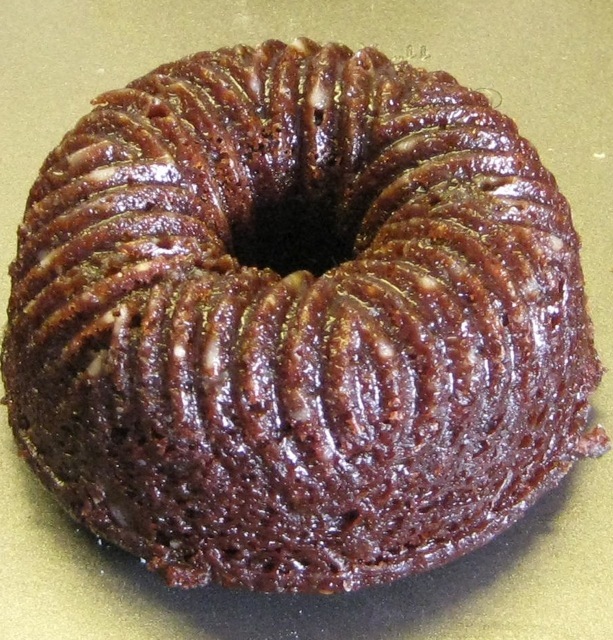 A larger bundt pan works fine, but the cake will be a bit short. I usually cool the cake, then leave it in the pan and cover with plastic wrap and unmold it the next day. That gives it plenty of time to soak up all the syrup. Update: I haven’t tried it, but my mother-in-law reports that this cake freezes well. If you try it, I suggest giving it a couple of days for the flavor to develop before freezing. These are SO beautiful…and what a wonderful gift! Thanks for sharing that juice would work here, too. Did you use eggs or egg substitute in the recipe? Hi Jennifer! I’ve always used real egg whites. If you try it with juice, let me know how it is! Ooh, yummy! And from Cooking Light? Better yet! I used to make Grand Marnier brownies and they were always a big hit. I think it’s worth it to buy a bottle of nice liquor for baking now and again. A little goes a long way and they last for ages. Oh, how pretty! I love that you get different shapes from one pan, how fun to make and take something as a gift in them. Sounds like a great recipe as well. Mmmmm – even though I enjoy the gum numbingness of liquor soaked cakes, a milder version like this could hit the spot. And I agree, there is no substitute for Grand Marnier. Jill – LOVE these – I have that pan too, and need to bake something in it this season! Everything tastes better with liqueur! Especially Grand Marnier… Thanks for the recipe – I’ll give this one a try. I love that there’s liqueur in both the cake and glaze! They look absolutely beautiful! This looks amazing!!! Choc orange is such a fabulous flavour combination. These bundts are so handsome – I love how they look like burnished bronze. Wonderful! I love Grand Marnier and the cake looks tender and delicious. Definitely on my “to copy” list. You’re right about these mini pans, Jill. I am going to have to get me some and try this recipe next year for gift-giving. Lovely! These look wonderful Jill. Yum. Have a great Christmas! Great recipe. This sounds delicious. I love your mini bundts!